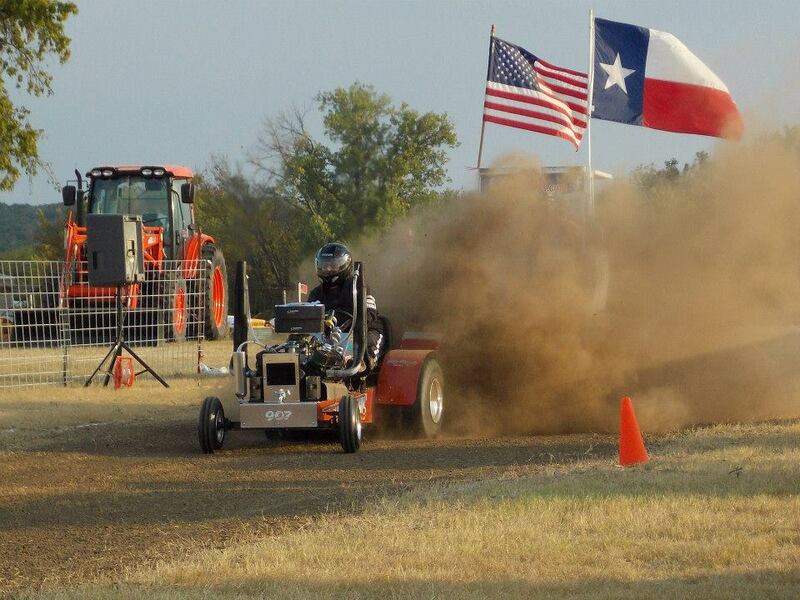 LSGTPA tractor pulling teams rolled into Alvarado, Texas for the Johnson County Antique Tractor Club Show and Pull. 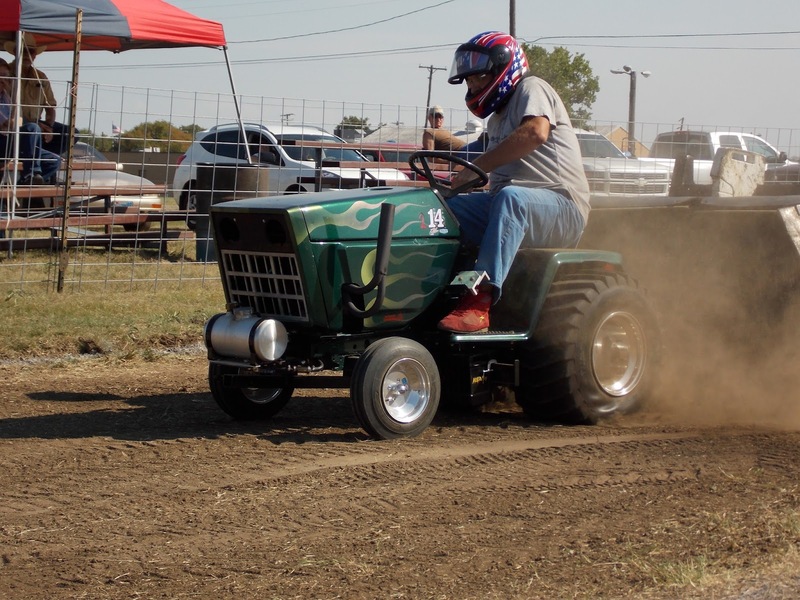 Teams competed on the hilltop track at the historic Pioneers and Old Settlers Reunion Grounds, with two rounds of tractor pulling action to determine the winners. Opening ceremonies featured the invocation by Arlen Foulks of Racers For Christ, followed by our National Anthem presentation by the super talented Jade Flores. The Texas singer-song writer delivered an amazing performance, and will be a feature act during the upcoming Texas State Fair Country Showdown. Jade Flores and Arlen Foulks presented the invocation and National Anthem during opening ceremonies. 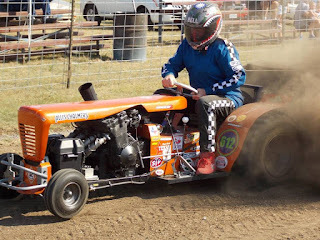 The LSGTPA Youth Class drivers took to the dusty track first, with Mason Hovind leading the pack with an opening round Full Pull to take the win, aboard his 'Yes Deere' tractor. 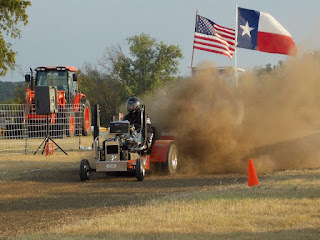 Lane Duncan piloted his 'Texas T-Rex' tractor to an opening round Full Pull, to score a second place finish on the day. Kody Langham placed his Bonham Service Center sponsored machine on the podium in third place, with Jared Stephan driving his 'Iron Head' tractor to a fourth place finish. 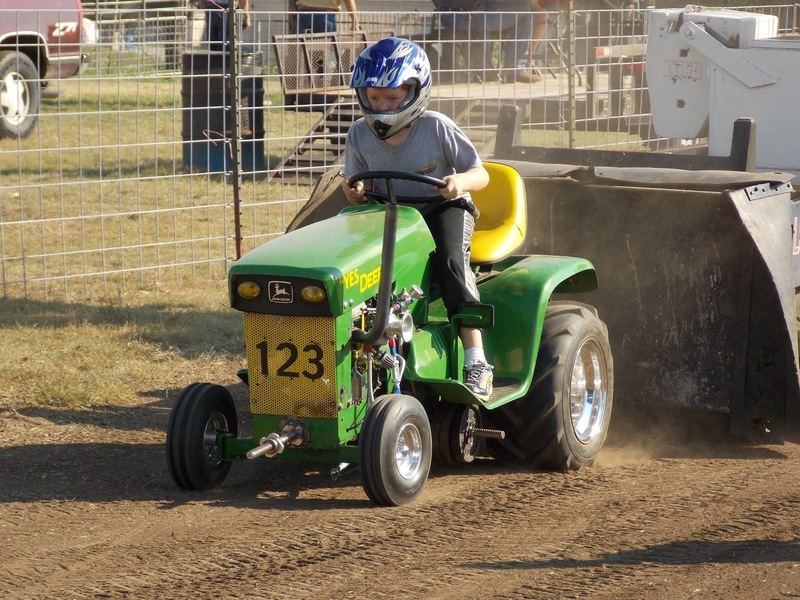 Mason Hovind steered his 'Yes Deere' tractor to the top spot in the LSGTPA Youth Class. In Stock Class, Claude Lewis would take the top honors over the runnerup tractor of James Helfferich. Jimmy Helfferich would pull to a third place finish. In Hot Stock, John Aufdenkamp would place the 'Rusteze' tractor atop the field. Aidan Hovind pulled to the runnerup spot, aboard the 'Yes Deere' tractor. Kody Langham wheeled his Longhorn Express Pulling Team entry into the third place, with Claude Lewis pulling to fourth. 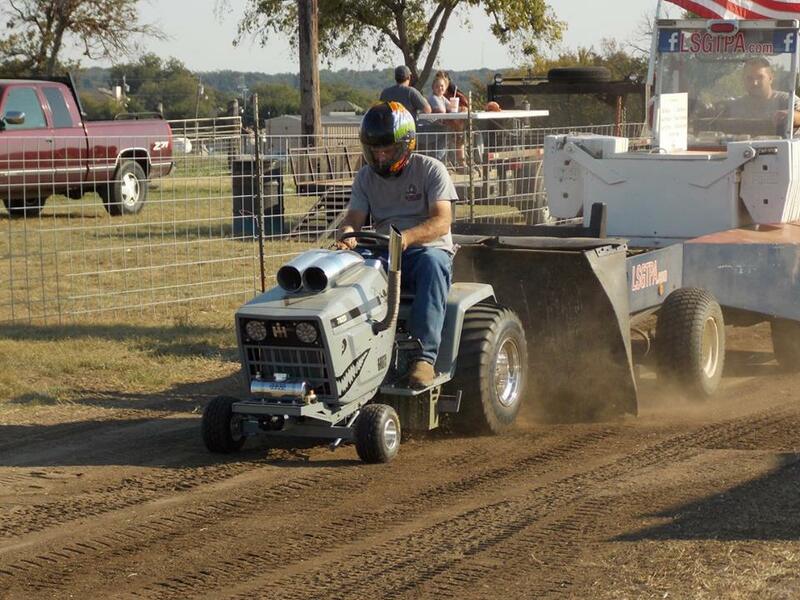 Claude Lewis wheeled his tractor downtrack in Alvarado, to place fourth in Stock Class. Stock Diesel Class was led by Steve Hovind aboard his beautiful new Mean Green Pulling Team entry. Patrick Bramlett finished in second, with a strong performance with his awesome looking new 'Warthog' tractor. The 'Warthog' diesel, is patterned after the US Airforce A-10 Thunderbolt, which is nicknamed the 'Warthog'. 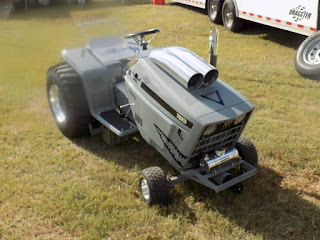 Bramlett's tractor is a work of art, and even features a Gatling gun on the nose ! 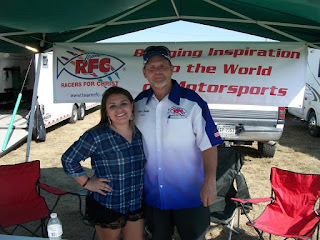 Ken Langham, Jr. pulled to a third place podium finish in the class, aboard his Longhorn Express Pulling Team diesel. James Helfferich finished in the fourth place position in the class. Patrick Bramlett piloted his 'Warthog' machine to runnerup, within a foot of the leader, in Stock Diesel. Big Stock was won by Kolby Langham, aboard his 'Texas Thunder' machine. Jerry Toland finished second, aboard his 'Triple Deuce' tractor. John Aufdenkamp placed his Outlaw Pulling Team entry in the third place, with Alton Degner riding his 'It'll Do' tractor to fourth. Jimmy Helfferich placed fifth in the Big Stock Class. 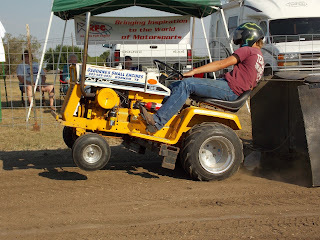 Paul Smith doubled down with his 'Texan' tractor, winning the hand in Motorcycle and Outlaw Classes. Paul Smith pulled double duty aboard his 'Texan' tractor, taking the title in both the Motorcycle Class and the Outlaw Class ! The Mini Rod Class tractors put on a great show, with Jerry Toland taking the win aboard his 'Shinin Time' tractor, by a margin of victory of just over 1 inch ! 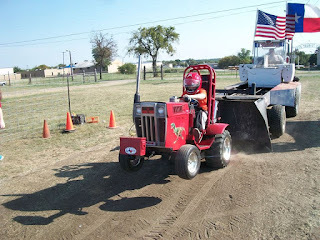 Colby Crowe and his ' Weekend Warrior' tractor finished in the runnerup spot, with Sarah Crowe finishing third aboard her Moody Pulling Team turbocharged diesel tractor. David Houchen pulled to a fourth place finish, aboard his 'Back In The Day' tractor. Sarah Crowe rolls coal and dirt, aboard her '99% Moody' turbocharged diesel Mini Rod Class tractor. 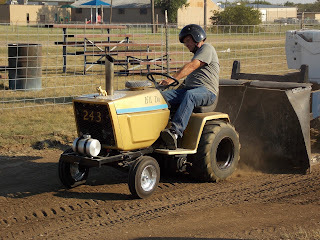 The Super Rod Class tractors closed the show, with Ken Langham posting two Full Pull's to dominate the class on the day. 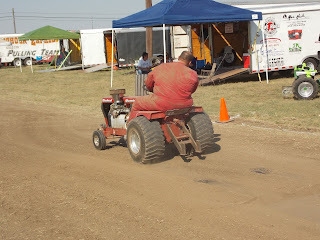 Randall Moody scored a Full Pull aboard his 'Ridge Runner' tractor, to finish in the runnerup spot. John Kiemele placed his 'Dodge This' tractor, on the podium in the third place position. 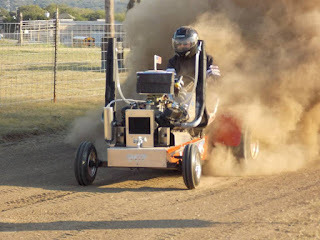 'Dodge This' wowed the crowd with a dust cloud, piloted by John Kiemele. 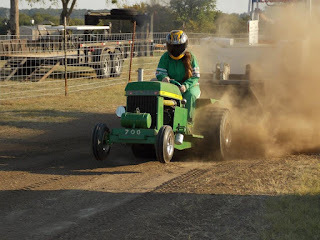 The LSGTPA pulling teams will roll into Farmersville, Texas on the weekend of October 3rd, for a high noon showdown during the Old Time Saturday celebration. 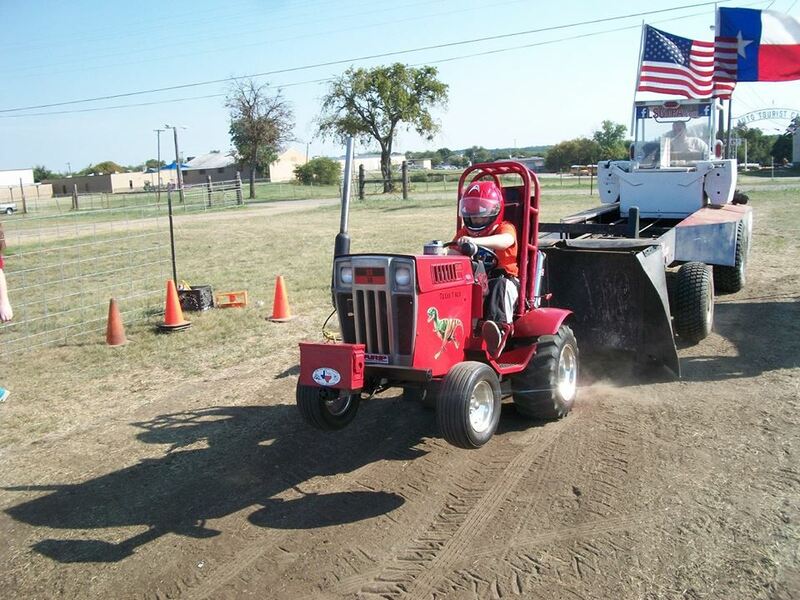 Lane Duncan wheeled his 'Texas T-Rex' tractor to a runnerup finish in LSGTPA Youth Class competition. Kolby Langham hangs on to his Longhorn Express Pulling Team machine. John Aufdenkamp wheeled his Outlaw Pulling Team entry downtrack in Alvarado. Randall Moody rides 'Ridge Runner' down the Pioneers and Old Settlers Reunion Grounds pulling track. Colby Crowe works the 'Weekend Warrior' downtrack to a runnerup finish in Mini Rod Class action. 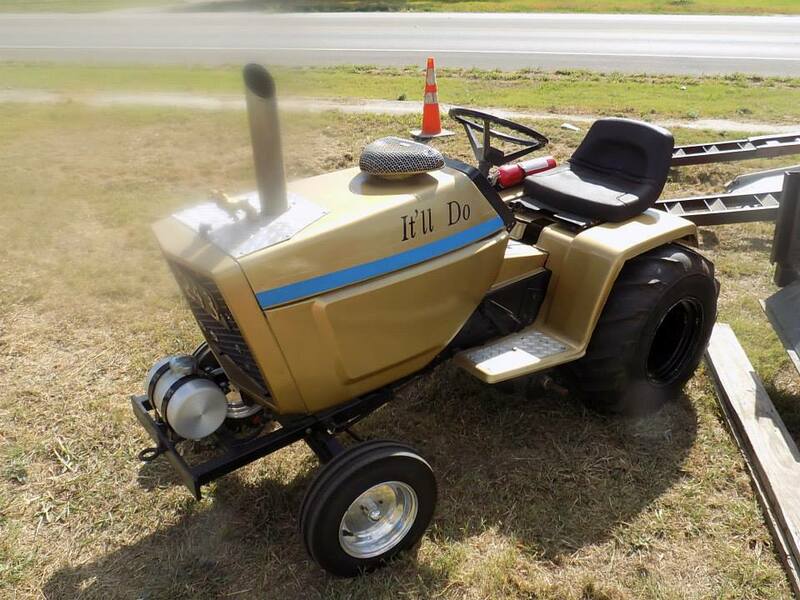 Alton Degner posted a top five finish aboard his 'It'll Do' tractor, during the Johnson County Antique Tractor Show and Pull in Alvarado. 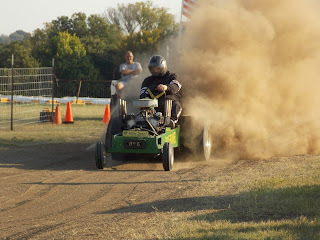 Steve Hovind takes his Mean Green Pulling Team entry downtrack, during LSGTPA Stock Diesel Class competition. 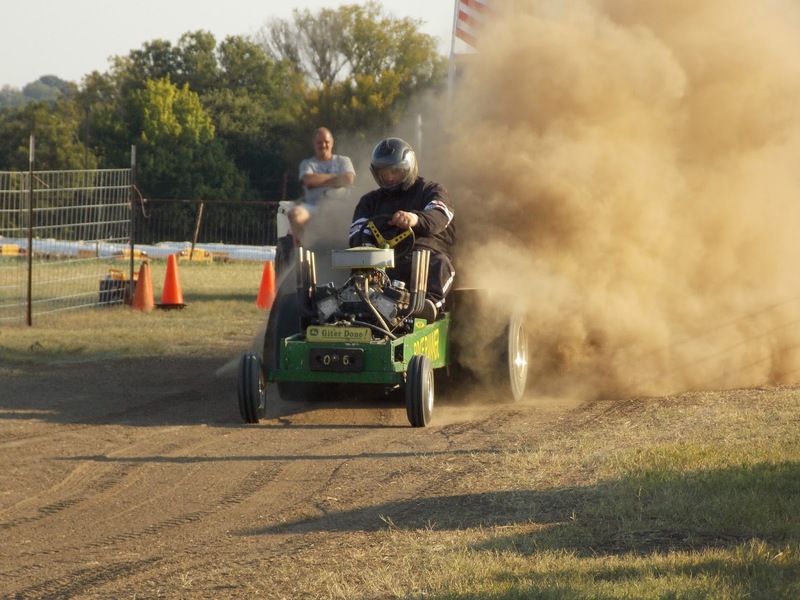 Colby Crowe leaves some rubber on the track, after a pull aboard his 'Weekend Warrior' tractor ! LSGTPA tractor pulling teams will be headed to Alvarado, Texas this weekend, to compete during the Johnson County Antique Tractor Club Show & Pull. The tractor show will begin at 8:00am on Saturday, with the LSGTPA tractor pull scheduled for a 2pm start. LSGTPA pulling teams will compete during the JCATC Show and Pull, at 2pm. Texas performing artist Jade Flores, will perform the National Anthem, during the LSGTPA opening ceremonies. Arlen Foulks of Racers For Christ, will deliver the invocation. 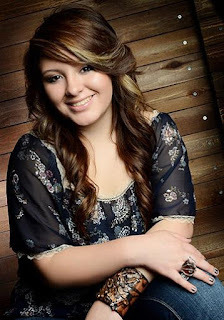 Jade Flores will be performing the National Anthem, during the LSGTPA tractor pull in Alvarado. 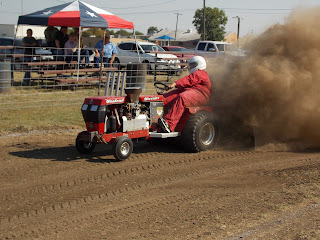 The pulling track is located on the Pioneers and Old Settlers Reunion Grounds, at 111 Reunion Drive, Alvarado, Tx 76009. Bartlett, Texas was founded in 1881, as a station along the Katy railroad. The town was named for John T. Bartlett, and was major shipping point for cotton through the early 1900's. Bartlett has played stage for several motion picture films, featuring the historic architecture of the town buildings. Bartlett also provides center stage for the LSGTPA tractor pulling teams, during the sixth stop on the 2015 LSGTPA tractor pulling season. The teams rolled into town during the Bartlett Old Town Festival weekend, and put on a great show for the fans and festivalgoers. Arlen Foulks of Racers for Christ, provided the invocation during opening ceremonies, followed by our National Anthem presentation. 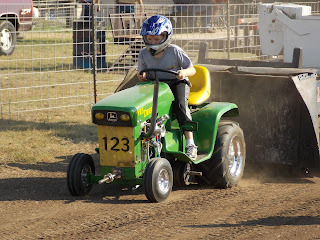 The Youth Class competitors then took to the blackland track, with Mason Hovind placing the 'Yes Deere' tractor on top of the class. Kody Langham pulled to the runner up position, aboard his Longhorn Express Pulling Team tractor. Jared Stephan aboard his 'Iron Head' machine, anchored the podium in the third place spot, for the Moody Pulling Team. The Stock Class title was taken by Claude Lewis aboard his Cub Cadet machine. In Hot Stock, John Aufdenkamp pulled to the victory aboard his 'Rusteze' tractor. 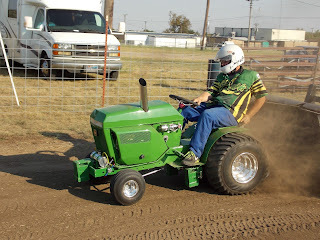 Aidan Hovind placed his 'Yes Deere' tractor in the runner up spot for the Mean Green Pulling Team, while Kody Langham pulled to third aboard his Bonham Service Center tractor. Stock Diesel class pullers were lead by Ken Langham, Jr, using a Full Pull on the two hundred foot track to top the field. Steve Hovind scored the runner up aboard his nicely done and recently finished Mean Green Pulling Team tractor. Patrick Bramlett made his debut aboard his great looking new 'Warthog' machine, and scored a third place podium finish. In Big Stock Class, John Aufdenkamp scored the win for the Outlaw Pulling Team camp. Kolby Langham brought home the runner up honors aboard his 'Texas Thunder' machine. 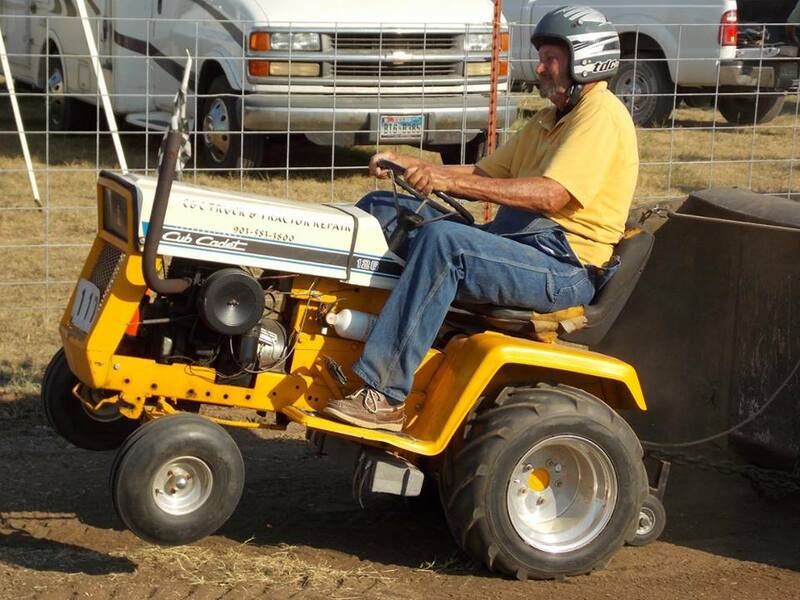 Alton Degner scored the third place finish aboard his 'It'll Do' tractor. Stock Altered featured the third class win on the day for John Aufdenkamp and the Outlaw Pulling Team. Michael Mayberry scored the runnerup in the class, after a wild ride took Mayberry out of bounds for a DQ in the second round. Paul Smith piloted his 'Texan' tractor to a double victory on the day, scoring first place in Motorcycle and Outlaw Classes. The Mini Rod Class title was owned by Sarah Crowe after the dust settled, having piloted her turbocharged diesel tractor to the top spot. Colby Crowe placed his 'Weekend Warrior' tractor in the runnerup spot, with David Houchen pulling the 'Back In The Day' tractor to a third place finish. The Super Rod Class tractors closed the show, with Ken Langham placing his Bonham Service Center tractor in the top spot. Randall Moody scored the runnerup aboard his 'Ridge Runner' tractor, with John Kiemele scoring third place aboard his 'Dodge This' machine. The LSGTPA teams will head to Alvarado, Farmersville, Sulphur Springs, and Rockdale, for a marathon finish of the 2015 pulling season ! Check out the www.LSGTPA.com web page for event details. Alton Degner was one of several pulling teams, sporting a blue stripe in support of law enforcement officers. Patrick Bramlett made his 'Warthog' tractor debut in Bartlett.